It continues! 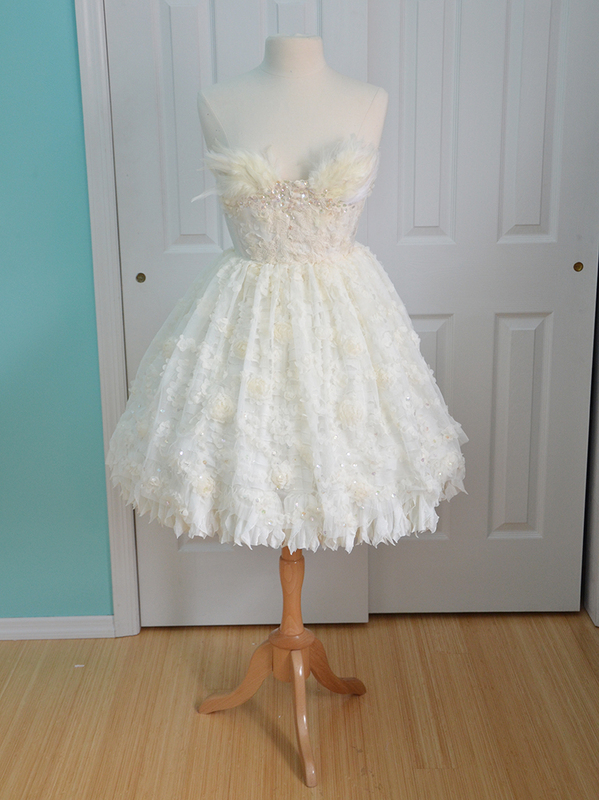 This is the second post about making my fluffy ivory dress, the first post talks about the concept and how I made the skirt. It can be read here, and the video that goes along with it is posted here! I would suggest viewing those first, if you haven’t already. 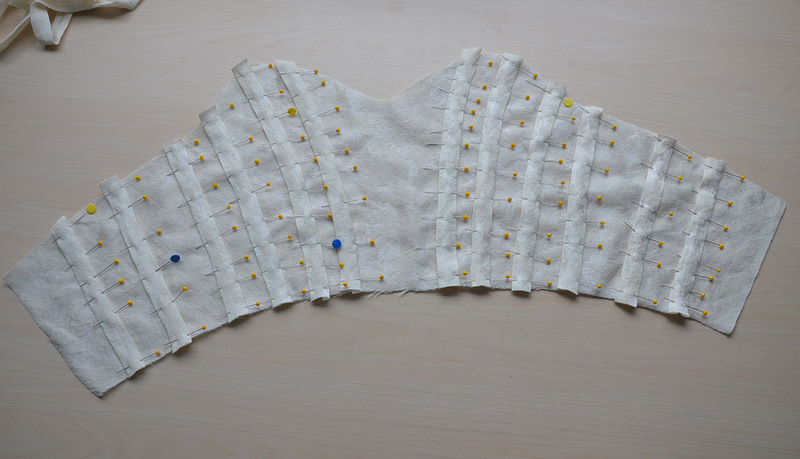 Now we can move onto the bodice, which I think is a lot more exciting. I draped the bodice on my dress form, but the process was a little different than usual since I was working around the shapes of various appliques. 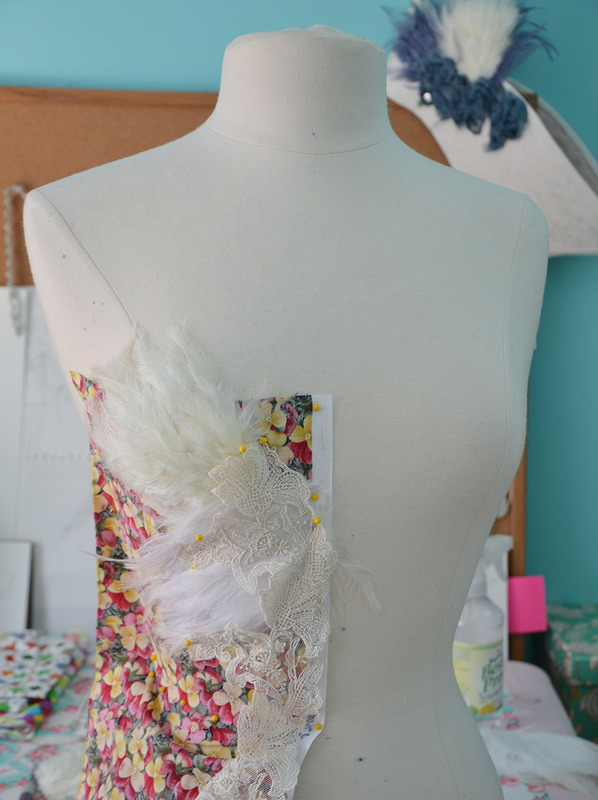 I draped fabric tightly around the form, then started pinning the appliques on top to determine the bodice shape. When I had an idea of where that was going I draped things properly and ended up with this! It has an odd, low neckline, which will eventually be covered by feathers. Off the form the fabric pattern looked like this. Because of the low neckline and my complete lack of bust I managed to make it all one piece, which is great! If I can avoid sewing princess seams I will. 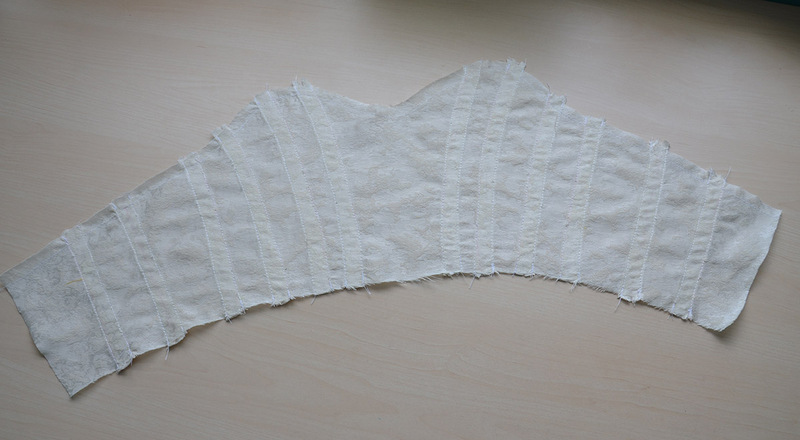 I transferred the fabric pattern to paper and marked out the boning channels. I decided to make the bodice very structured because I knew the lace/mesh/layers of fabric on the front would add bulk, and I really didn’t want to look bulky in the dress (or any dress). I cut strips of the jacquard i’m using for the bodice and ironed the edges inward to get three quarter inch trim. These will be used for boning channels and to cover any raw edges. 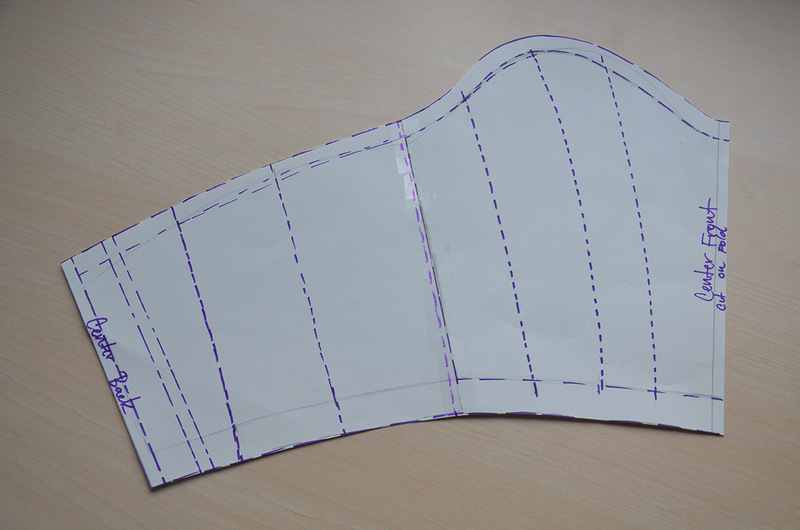 I cut out the bodice pattern and marked out all the boning channels. Then I lined the edges up and pinned my trim down! Those all got topstitched down. The amount of pins proved to be a bit dangerous but I managed to avoid getting blood on the dress, so all is well! I also stitched a half inch away from the top edge, this creates a “stopper” for one end of the boning and provides a guideline for how long each bone should be. I used hooping wire for boning since I wanted it to be really stiff and straight. I tipped it with duct tape and wrapped the ends in scotch tape to make sure it wouldn’t move. Not the best method, but it is fast and works! Then I stitched a half inch away from the bottom edge, creating another stopper so the boning can’t escape. Finally I pinned the top edge over. It got stitched down by hand, so I wouldn’t break any needles on the boning! 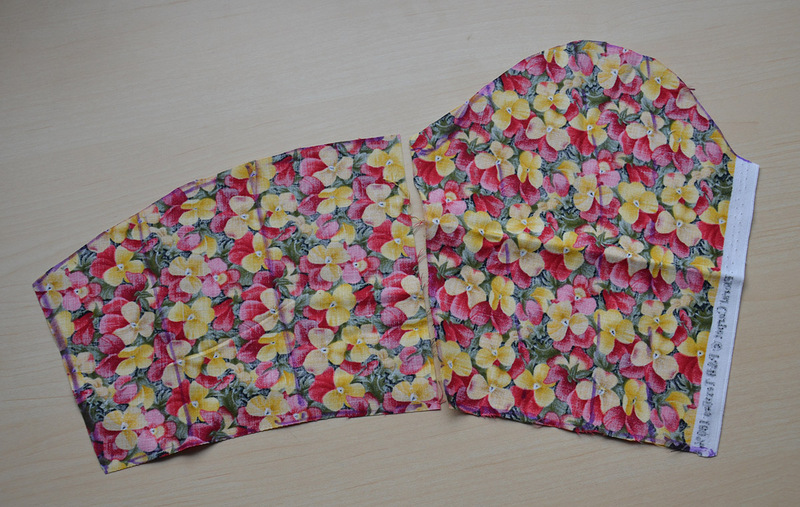 The bottom edge doesn’t get turned over since that seam allowance is needed when attaching the skirt. That bias tape I made earlier got pinned over the raw edge to finish it off. I really didn’t want to add lining to this bodice so I decided on bias tape instead. 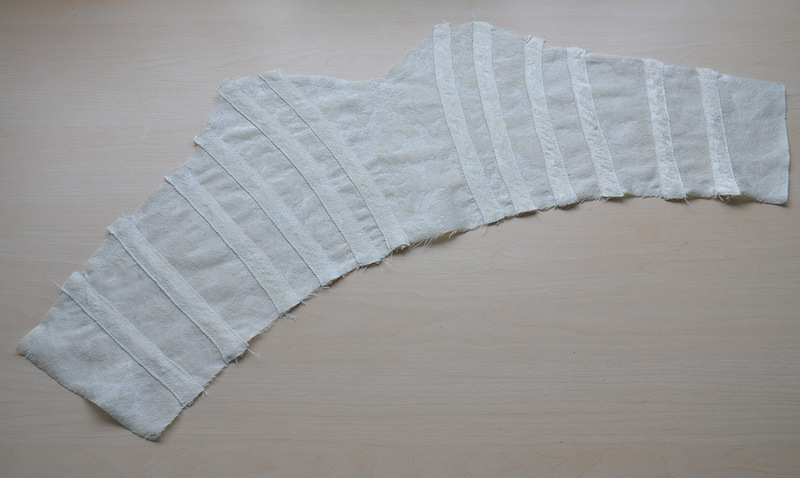 Here it is all stitched down – I did this part by hand too! And I had a nice, but very plain bodice. It was practically begging to be embellished. ….so I did just that. This is actually my “test” to get a good idea of how to lay things out. 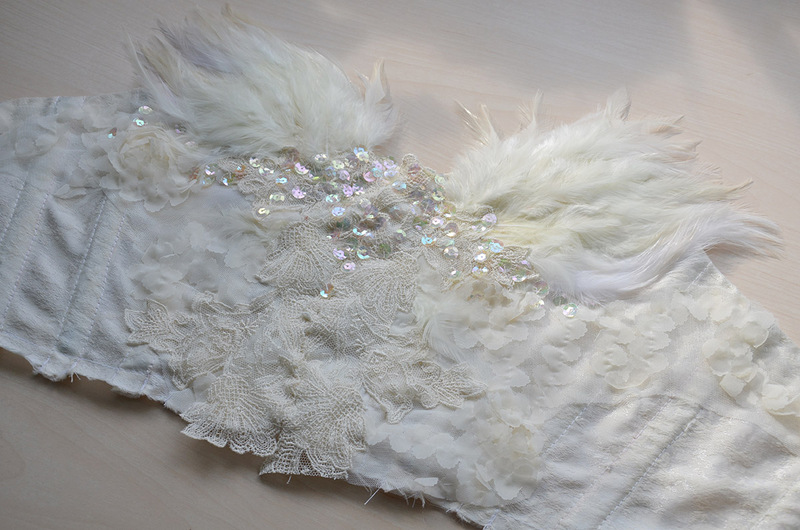 I’m using leftover fabric from the skirts, lace, sequins, and feathers that are glued to buckram. I believe these are sold for fascinator decoration, but I bought them a long time ago for a hood that I never made. 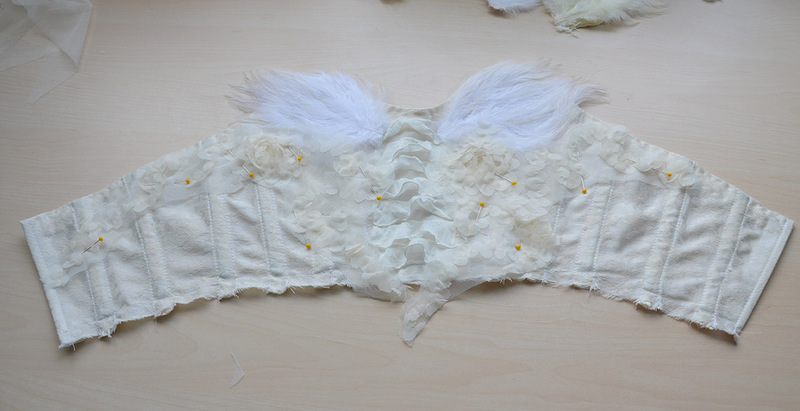 All that got unpinned and (kind of) arranged around the blank bodice. The first thing to be attached was the ruffled jersey. Then the white feathers were stitched on with upholstery thread. Normal cotton thread gets shredded when sewing buckram which is why I used a much heavier alternative. I pinned mesh mounted chiffon flowers (fussy cut from leftover skirt fabric) overtop. I was aiming for a very layered, texture heavy type of look. 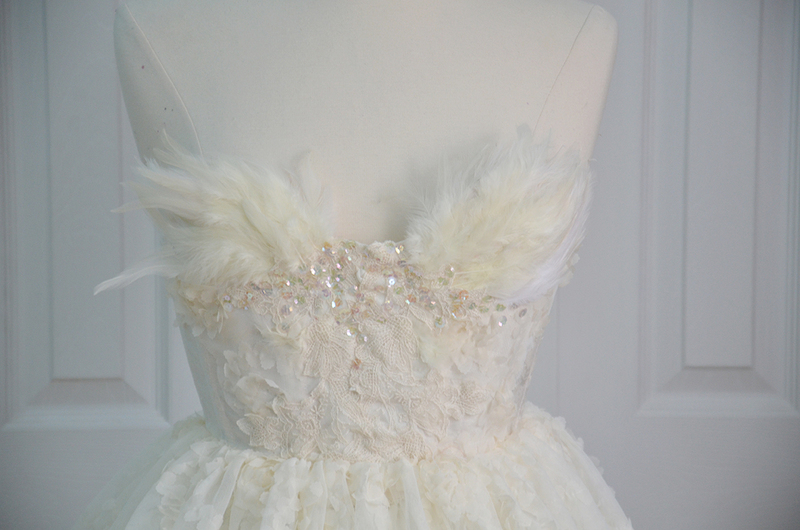 Then I added lace to the center front, and finally, the ivory feathers! It was still looking a little boring, so I went ahead and added dozens of sequins. And it was pretty much done! I was really happy with it, so I moved on with the finishing touches. The first thing to do was add eyelets. I wanted this dress to zip closed but I forgot seam allowances at the back of the dress, so it ended up being an inch smaller than it should be. I can lace myself into things that are too small, but zippers aren’t that forgiving, which is why I opted for grommets! And that was pretty much it, actually. I sewed on the skirt and stitched up the back with a french seam. I should probably finish the seam at the waist with bias tape, but i’m leaving it for now since none of the fabrics fray that much. This is the finished dress. And a close up of the bodice! One feather is trying to escape. I might have to pluck it, but hopefully hairspray can fix it. Overall I’m really happy with this dress. I think it’s very pretty. It is similar in shape to my flower dresses and I don’t think I learned anything from making it, but sometimes you just want to make something fun that you know will turn out well! Even though the dress is done, I did make a mesh overlay which has sleeves on it. So this project isn’t over! 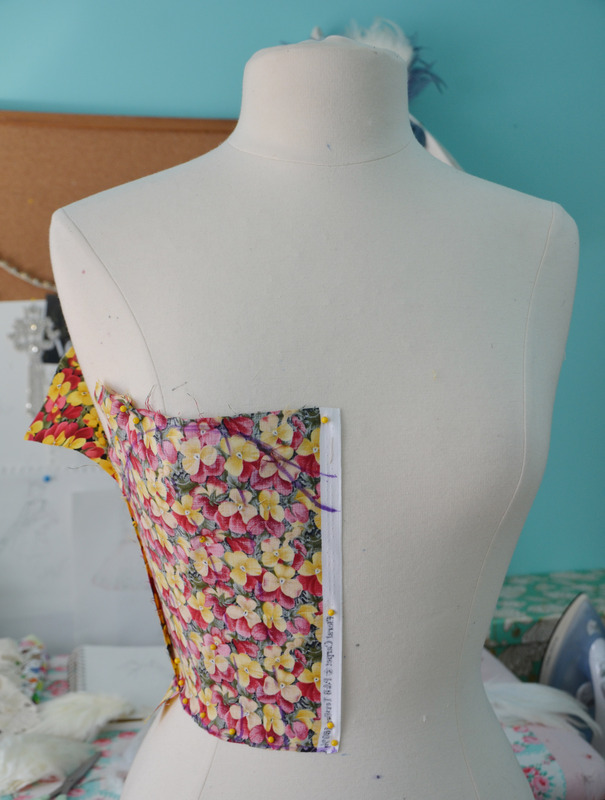 Also there is a video about making this bodice, and it is posted here! Boning casing is a bit tricky – you want the channel to be large enough the boning slides in easily but not big enough that it can rotate. At the same time if it’s too tight, it’ll force the boning to twist which is worse. But yes, when done correctly the boning stays flat! Bias tape is just the american term for bias cut strips of fabric (“tape” referring to strips of fabric) it isn’t actually sticky! Thank you – i’m glad you are enjoying them! I store them everywhere I have room haha. I have bins under my desk, hat boxes, dresser drawers, bins under my sewing machine, and a 20″ clothing rod in my closet all devoted to costume storage. 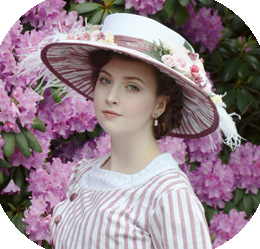 I make all my foundation garments (hoop skirts, petticoats, etc.) separate from dresses and store them crammed in bins, then just hang them overnight and steam them before wearing. That is a HUGE part of space saving. Ball gowns really aren’t that big when you remove what gives them shape and leave the fabric shell. My 20″ clothing rod has 11 dresses living on it – including three ball gowns (my christmas costume, butterfly dress, and red pleated dress). 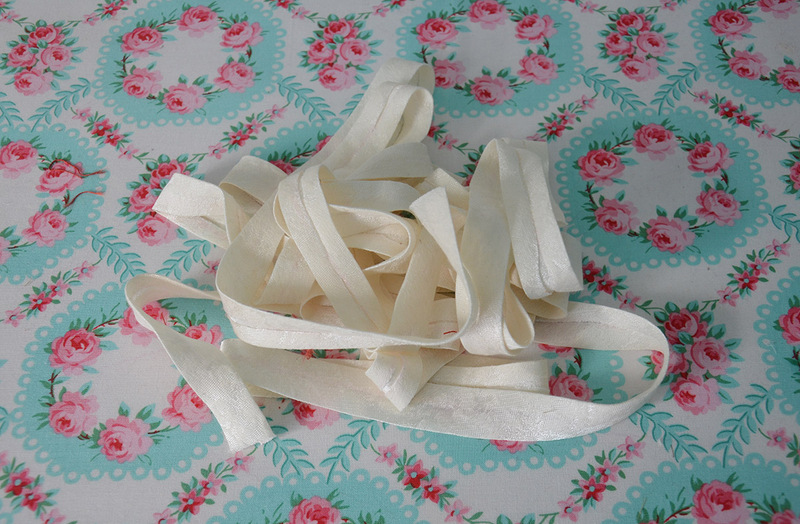 I have a question about bias tape: I have never worked with it before and I was wondering, does it fray at all? It seems like it should, with it being unhemmed, but I don’t know, haha. Haha, I know what you mean! That stuff usually bothers me too, but for this project I felt it would add to the texture of the garment which is why I used them together. Fabric cut on its bias is cut cross grain, which makes it much more difficult for the weave to unravel. It does fray but very little compared to strips cut on a straight grain. In the end it doesn’t really matter, since all the ways bias tape is attached involve only the folded edges being visible! Turn out well indeed! It is lovely and I bet it’ll be so much fun to wear! I would be constantly swinging the skirt around! I would love to make dresses like some of yours, but I have no place to wear them anyway. My sewing is mostly relegated to utilitarian stuff like the chair cushions I made yesterday, stuffed toys, simple clothes like jammies and such, repairs, patches and replacement zippers. Boring stuff. (Although the toys are sometimes fun!) I have a few fabrics here that I adore and would love to find some incredible use for, but I hate to make a fabulous dress that will sit unused forever. I loved it!! You’re great!!! Hi Angela! I have a quick question. How would you add a lace overlay to an already made dress? I know how to do it on just fabric, but not on a dress. Thanks! This is absolutely beautiful! I absolutely adore all the dresses you made in this style, like the flower dresses! You are really talented! This dress is so beautiful!! You are such an inspiration!! !